I don’t know about you all, but one of my favorite things about the holidays are lights. Honestly, I keep them up all year on my back deck because they make me so happy! Events that kick off the season are so fun to attend and almost always free. 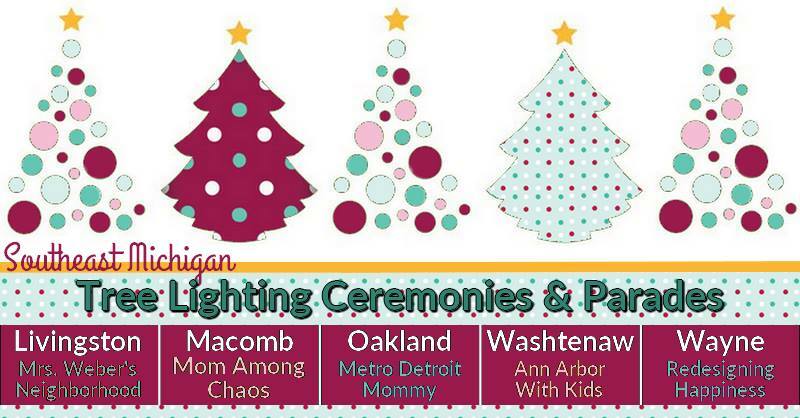 So bundle up and check out yet another blogger collaboration of tree lightings and parades around southeast Michigan. Below you will find my list of Livingston County happenings. Please drop me a note if I’ve missed any! Description: Enjoy holiday music, local dance performances, hay and train rides, a petting farm, letters to Santa, tasty holiday treats and, of course… a visit from The Big Man Himself. Time: Activities begin at 4 p.m., followed by the Fantasy 5K at 6 p.m., and the parade at 7 p.m. Description: The Fantasy of Lights activities attract more than 30,000 people to enjoy more than 50 illuminated floats, marching bands, vehicles, musical entertainment and animals. Description: Visit downtown Fowlerville for a parade, a pet parade, hot air balloons, a breakfast with Santa himself, and more. Description: Visit downtown Pinckney for Santa ‘lighting the park’ with his magical Christmas snow and stay for Christmas Caroling, a live Nativity scene, tasty treats and more. Where are your favorite lighting ceremonies and parades? Drop me a note if I’ve missed any around Linvingston County!